Solar System Origins: No Supernova? How do we get from clouds of gas and dust in interstellar space to stars like the Sun? It takes the right triggering event, which can cause such a cloud to collapse under its own gravity, and we’ve generally assumed that the trigger was a supernova. Indeed, one way to check the theory is to look for the radioactive isotope iron 60 (60Fe), which is considered a marker for a supernova as it can only originate in such an event. Early Solar System materials have shown high levels of iron 60, so a supernova has been assumed to have nudged the Solar System into formation. But Haolan Tang and Nicolas Dauphas, two researchers from the University of Chicago, have produced results than draw this picture into question. Their samples of meteorites were the same materials other researchers had studied, but the Chicago team used different methods to remove impurities from the observation, producing results with, they believe, fewer errors. What they found was that levels of iron 60 were steady — and low — in the early Solar System material. In other words, there is no clear sign of the explosion of a nearby star just before our Sun was born. These results seem to be backed up by Tang and Dauphas’ study of iron 58, an isotope likewise produced in supernovae. “The two isotopes act like inseparable twins: Once we knew where iron 58 was, we knew iron 60 couldn’t be very far away,” Dauphas explained. And sure enough, the meteorite samples showed little variation in iron 58, leading to the belief that both isotopes were uniformly distributed. In that case, the iron 60 we do find at low levels must have come from iron 60 that had accumulated in the interstellar medium from supernovae in the distant past. Image: Scientists in the University of Chicago’s Origins Laboratory have published the latest in a series of papers about the origin of the solar system. 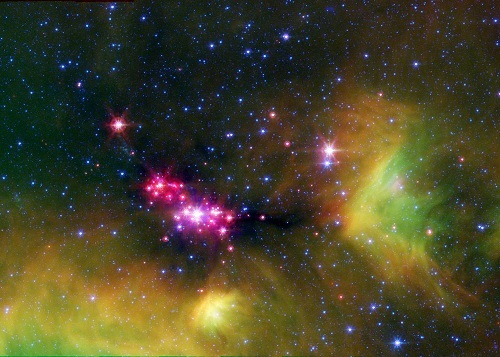 Infant stars glow reddish-pink in this infrared image of the Serpens star-forming region, captured by NASA’s Spitzer Space Telescope. Four-and-a half billion years ago, the sun may have looked much like one of the baby stars deeply embedded in the cosmic cloud of gas and dust that collapsed to create it. Credit: NASA/JPL-Caltech/L. Cieza (University of Texas at Austin). …a nearby stellar source for 26Al is still needed. This could have been a passing AGB-star that delivered 26Al and little 60Fe through stellar winds (Wasserburg et al., 2006). However, the probability of encountering an evolved AGB-star in a starforming region is very low (less than 3 in a million; Kastner and Myers, 1994). A massive star is therefore the favored source for 26Al, requiring special circumstances in order to avoid delivering too much 60Fe. We favor the first scenario of injection by winds from one or several massive stars… because decoupling of 26Al from 60Fe is a natural outcome of the evolution of massive stars and such pollution is expected to occur in star-forming regions. In the parent molecular cloud to the Sun, massive stars evolved rapidly, blew-off 26Al-rich winds, and carved a bubble within the cloud. The Sun formed later and incorporated some of the bubble shell material polluted with 26Al from the first generation of massive stars. It’s an intriguing notion, though as I read the paper it can only argue that a nearby supernova is not consistent with the iron 60 levels we see when early Solar System materials are properly analyzed. It takes the giant nearby star scenario to explain the aluminum 26 levels, which otherwise imply a supernova, and on that issue I suspect there will be plenty of debate. I highlight this paper because of the nature of the investigation. The universe carries its history in the materials around us, which here suggest the passage of a giant star through a cloud of gas and dust that, billions of years later, would become a system populated by beings capable of recovering its origins. And if that doesn’t evoke a sense of awe and perspective, it’s hard to see what would. The paper is Tang and Dauphas, “Abundance, distribution, and origin of 60Fe in the solar protoplanetary disk,” Earth and Planetary Science Letters Vol. 359-360, (2012), pp. 248-263 (preprint). I love watching the scientific models of the origin of the Solar System be debated and changed with new evidence and hypotheses- it underscores the fact that science is a dynamic process, not a static list of “things we know” like some science textbooks suggest. The models in our older science books become outdated, with time, as new evidence comes to light and new hypotheses are put forth by researchers. I’m definitely watching this space. The origin questions about the formation of our own planet and the life upon it are some of the most intriguing scientific questions humans have thought to ask. I thought that there was just to much inferred Al-26 when chondrites formed for anything other than a supernova to be responsible. Could anyone here please inform me if that alternate AGB dose is quantitatively credible? An international team of astronomers has used HiCIAO (High Contrast Instrument for the Subaru Next Generation Optics) [Note 1] to observe a disk around the young star SAO 206462. They succeeded in capturing clear, detailed images of its disk, which they discovered has a spiral structure with two clearly discernable arms. On the basis of their observations and modeling according to spiral density wave theory, the team suspects that dynamic processes, possibly resulting from planets in the disk, may be responsible for its spiral shape. This research may provide the basis for another indirect method of detecting planets. Scientists have known that planets form in a broad disk of dust and gas surrounding a star, a so-called “protoplanetary disk.” However, the composition of these special disks as well as the process by which they give rise to planets have remained a mystery. The bright light of a central star makes it difficult to detect fainter objects around it or to capture a detailed image of the composition of the disk itself. Recent research with HiCIAO, Subaru Telescope’s “planet-hunter”, has overcome some of those obstacles. By masking the bright light from the central star, the instrument can then detect more detailed features of the star’s disk and the objects that it contains. As part of the SEEDS project (Strategic Exploration of Exoplanets and Disks with the Subaru Telescope) [Note 2], the researchers in the current study used HiCIAO to conduct observations of the disk around the young star SAO 206462 (sometimes referred to as HD 135344B). This star is about 460 light-years away from Earth in the constellation Lupus (“the wolf”) and is some 9 million years old. The radius of the disk is 20 billion kilometers (12.4 billion miles), about five times greater than Neptune’s distance from the Sun in our solar system. The researchers captured images of SAO 206462’s disk (Figure 1) that clearly reveal its spiral structure and indicate some features of its composition. They then were able to analyze its spiral structure by using density wave theory to infer the properties of the disk. This process allows a productive interface between observational data and a theoretical model. Density wave theory has been applied to explain the spiral arm structure of spiral galaxies. It proposes that a rotating disk of matter would “naturally” develop regions of enhanced density, so-called “spiral density waves”, due to differential rotation. The wave-like concentration of dense material grows and forms a spiral pattern. A similar process may be at work in SAO 206462’s disk. When the team compared their model with the observational data, they found that it was useful in revealing the features of the disk (Figure 2). The team was able to use the model to estimate the temperature of the disk based on dynamic processes and predict the evolution of the spiral structures. The observational data conform to the model. Although they could not specifically identify the origin of the spirals, it is possible that planets embedded in the disk may be the catalysts for the development of its shape. If a planet has already been formed in a disk, its gravity can produce a density wave, which then may result in the creation of a spiral structure in the protoplanetary disk (Figure 3). Although the observed image does not necessarily show the existence of a planet, the possibility remains that a planet in the disk causes the density wave. This is the first time that density wave theory has been applied to measuring the features of a protoplanetary disk. The research takes an important step in explaining how a spiral disk could form and may mark the development of another indirect means of discovering planets. 1) HiCIAO (High Contrast Instrument for the Subaru Next Generation Adaptive Optics) is designed to block out the bright direct light from a central star so that it can image nearby faint objects such as planets and detect faint dust disks around the central star. 2) SEEDS (Strategic Exploration of Exoplanets and Disks with Subaru Telescope) is a large-scale project led by Motohide Tamura at NAOJ (National Astronomical Observatory of Japan). Researchers conduct observations at the Subaru Telescope that focus on the direct imaging and examination of exoplanets and disks to better understand the formation of planetary systems. Over 100 scientists and 25 institutions belong to the international consortium supporting the project. Since 2009, the SEEDS project has yielded a set of impressive findings, including imaging of the detailed structure of disks in AB Aur, LkCa15, HR4796A, and HD 169142. 3) A representation of how interaction between a protoplanetary disk and planet makes a density wave and affects the disk’s structure. A planet in the disk may be one explanation for the formation of the disk’s spiral structure. The basis for the simulation is a code in computational fluid dynamics called FARGO that simulates the flow of gases in motion. Colors indicate the surface density of the disk; the darkest colors show the areas with the least density while the white shows those with the greatest density. It may turn out that more ‘bizarre’ the explanation of the origin of Our Solar System will be its true natural history. The current ideas have beautiful ‘footnotes’ that go back to Newtonian physics with ‘The Nebular Hypothesis’ speculated by Laplace in the 18th Century. There is possibly be a ‘Supernova’ remnant that dates back 6 billion years ago? There is also a possibility that our solar system formed in a Seyfert dwarf galaxy and was ‘gobbled up’ by the Milky Way. How do you detect ‘fossil’ neutron stars that are damn near ‘cooled’ to the equivalent to luke warm bathtub water, cleared out all the nebular debris, and have almost no spin? And that rem anent could be at the other side of the Milky Way + 200,000 light years outside of any of the Spiral Arms? Easier to tabulate how many angels can crowd a segment of straw and calculated how many haystacks you can pack into the Milky Way. MOFFETT FIELD, Calif. — Scientists at NASA’s Ames Research Center now have the capability to systematically investigate the molecular evolution of cosmic carbon. For the first time, these scientists are able to automatically interpret previously unknown infrared emissions from space that come from surprisingly complex organic molecules, called polycyclic aromatic hydrocarbons (PAHs), which are abundant and important across the universe. Between 2003 and 2005, thanks to its unprecedented sensitivity, NASA’s Spitzer Space Telescope, managed and operated by NASA’s Jet Propulsion Laboratory, Pasadena, Calif., created maps of the tell-tale PAH signature across large regions of space, from hot regions of harsh ultraviolet (UV) radiation close to stars, to cold, dark clouds where stars and planets form. By exclusively using their unique collection of authentic PAH spectra, coupled with algorithm-driven, blind-computational analyses, scientists at Ames were able to interpret the cosmic infrared maps with complex organic molecules. They found that PAHs changed significantly in size, electrical charge and structure, to adjust to the different environment at each spot in the map. Carbon is one of the most abundant atoms in space and scientists believe that the spectral changes across these maps trace the molecular evolution of carbon across the universe. Results will be published May 14 in “Properties of PAHs in the Northwest PDR of NGC 7023 1: PAH size, charge, composition and structure distribution,” Astrophysical Journal, vol. 769 (2) article 117, 2013. To determine the spectral changes across these maps, these astrophysicists used the PAH spectra collected in the PAH IR Spectroscopic Database (http://www.astrochem.org/pahdb/) at Ames. They analyzed the Spitzer infrared map of the Iris Nebula (NGC 7023) that hosts both the extreme environment of a region close to a star, as well as the more shielded, benign environment of a cold molecular cloud. The new maps showed that small, electrically neutral, irregularly shaped PAHs are most common near the cold molecular cloud that is far from the star that excites PAH emission. However, when PAHs move closer to the exciting star and away from the cold cloud, they become large, symmetric and are electrically charged. “The large PAHs take over because they are more robust than the smaller, irregularly-shaped PAHs, which are destroyed by the unshielded star light,” said Christiaan Boersma, an astrophysicist at Ames. Finally, these large PAHs are themselves broken down, as they are stripped of hydrogen and become small fragments. At this point, the emission from the dehydrogenated PAHs takes over in the observed region. There were two findings that are especially important: the first is that positively-charged, nitrogen-containing PAHs are needed to complete the match between the correct spectral signature and the observed emission, and the second is that dehydrogenation and fragmentation occur close to the exciting star. This approach of analyzing the aromatic infrared bands using the spectra of individual PAHs provides new, fundamental information about the UV-driven, spatial evolution of PAH subpopulations. It also ties these variations to changes in local conditions, such as those due to the physical shape and history of the region, radiation field, etc. “Spitzer detected the PAH signature across the universe and showed PAHs were already forming only a couple of billion years after the Big Bang. Since PAHs are so sensitive to local conditions, analyzing the PAH bands, as we did here, represents a powerful new astronomical tool to trace the evolution of cosmic carbon and, at the same time, probe conditions across the universe,” concluded Allamandola. This work was supported by NASA’s Carbon in the Galaxy Consortium under the auspices of the Astrophysics Research and Analysis Program (APRA).